There was one bicycle shop I knew I'd end up visiting when in London. I'd heard about the Lock 7 Cycle Café from a reader and, since I was staying in the same neighbourhood, Hackney, it was just down the street. I'd also heard that the café was inspired by a trip the owners made to Copenhagen and I had to get an answer to that mystery. We don't have cycle cafés in Copenhagen. Well... I suppose we do... every café in the city can be cycled to so that kind of makes them all cycle cafés... but I digress. 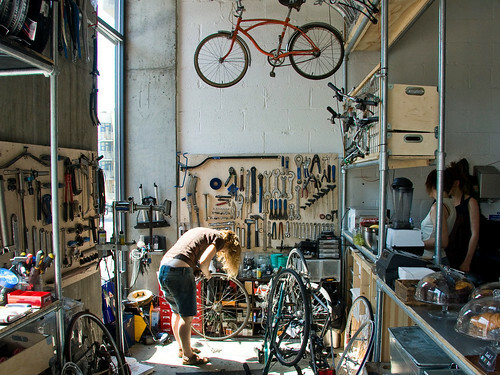 We don't have cafés that serve you coffee and food while your bike gets fixed. 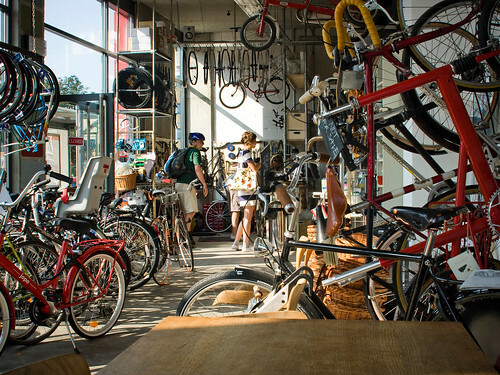 When I spoke with the owners I was told that it was merely the Danish capital's all-encompassing bicycle culture that inspired them to start a café in Hackney. Which is great. 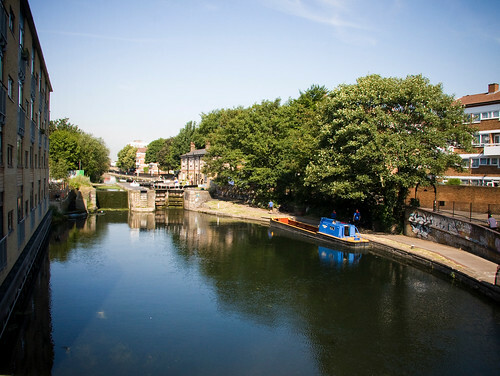 Lock 7 is like an anchor for the blossoming bicycle culture in Hackney in particular and London in general. Sitting outside on a Tuesday morning with a coffee, the parade of cyclists/Cycle Chicistas rolling past was astounding. It has to be the most cleverly placed bike shop in London. In the city on a whole there are 2% trips by bike but in Hackney it's 8%. Lock 7 has a fine, relaxed atmosphere and friendly staff. When they started out the café was a lot larger but now the tables are a bit fewer to make room for the bikes. They repair them and they sell them and I spotted a shiny new Velorbis in the stable of new bikes. All they need now are some Bullitts from Larry vs Harry to complete the Copenhagen Connection. A location next to a constant flow of cyclists is a plus, but check out the rest of the location. It has to be the best view from a bike shop I've ever seen. Lock 7 is named after this seventh lock on the Regent's Canal that winds it's way through London. It's not because you need seven locks to secure your bike in the city. Four will do, apparently. 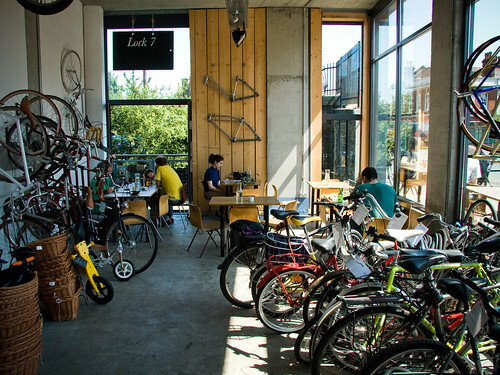 Lock 7 Cycle Cafe is located at 129 Pritchards Road, London [Hackney].